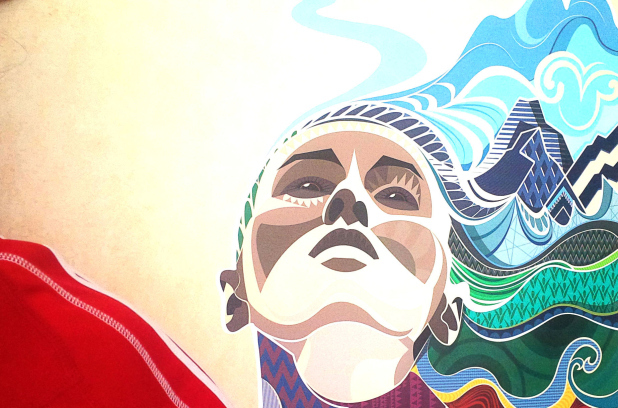 The FIFA Women's World Cup is upon us! And N*Sync performed the Opening Ceremony in baggy warm up pants and soccer jerseys. The US earned a 3-0 victory over Denmark. I was hooked for life. My grownup household still eats, sleeps, and breathes soccer. Sadly, the six snow days added to the end of the school year in my district mean that we cannot travel to Canada to experience the tournament in person, but you can bet we will be watching. What about you? Need a good reason to watch? Excited now? 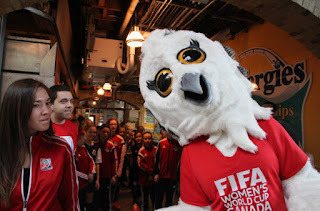 Want to know more about this year's tournament? 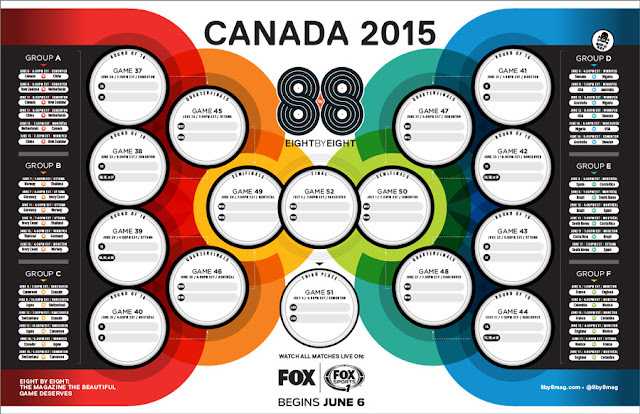 The tournament begins June 6th and concludes on July 5th. It's taking place in Canada, with 52 matches being played in Edmonton, Moncton, Montreal, Ottowa, Vancouver, and Winnipeg. 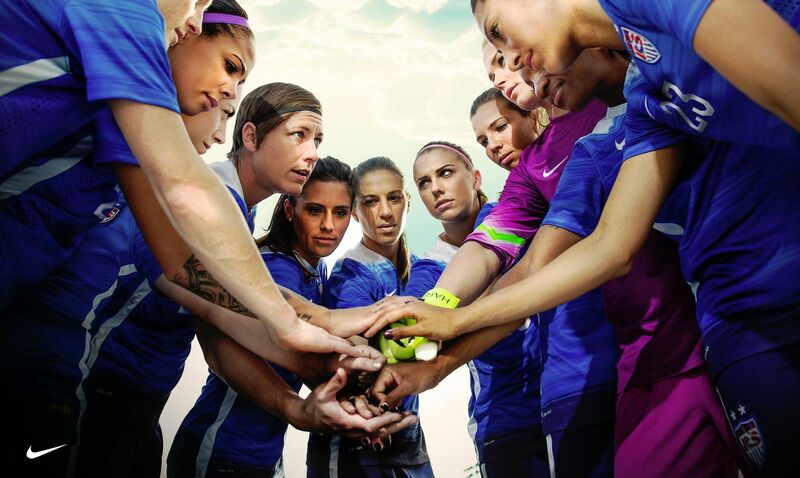 For the very first time, 24 teams will compete in the Women's World Cup. 12 teams competed in the tournaments in 1991 and 1995. In 1999, the tournament was increased to 16 teams. The men's tournament features 32 teams. The tournament is made up of 6 groups with 4 teams in each group. The first round, or group stage, is a round robin where each team plays one match against each of the other teams in the same group. 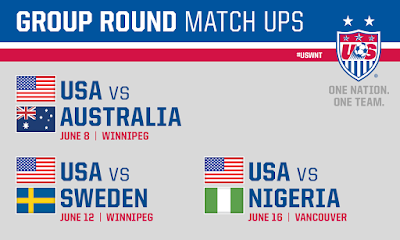 The 2 teams with the best record from each group move forward to the knockout stage, along with the 4 third place teams with the best records from the whole tournament. Yes, this is confusing. But 24 teams doesn't whittle down to 16 when you divide it by 2, so the bracket had to be filled out to prevent anyone having a "bye" in the knockout stage. 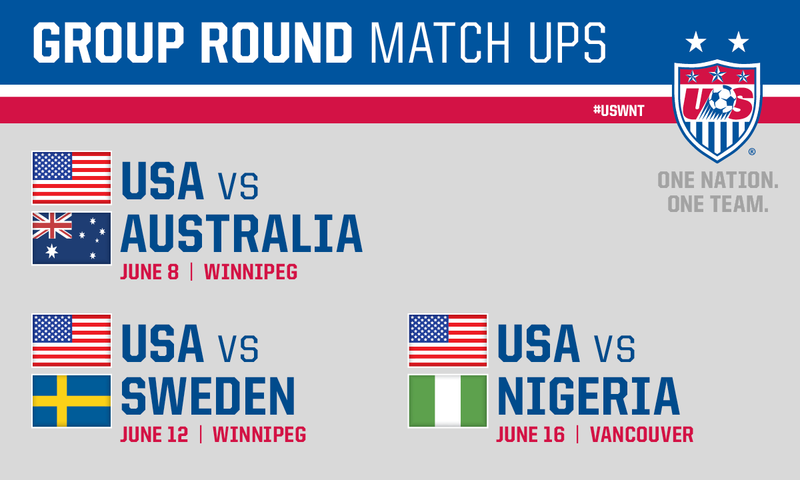 The US is in Group D, along with Sweden, Australia, and Nigeria. Group D is being referred to as the "Group of Death", a name traditionally bestowed upon the group believed to be most difficult to advance from. 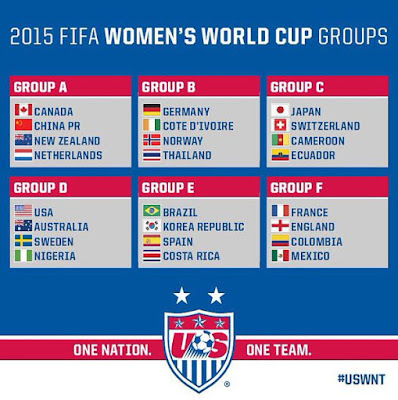 Group D includes 3 teams in the FIFA Top Ten rankings. Sweden is coached by former US coach Pia Sundhage. Australia is a strong team and Nigeria is considered the best African team in the tournament. After the group stage is complete, the tournament moves to traditional single elimination format. Go download your bracket from Eight by Eight magazine. 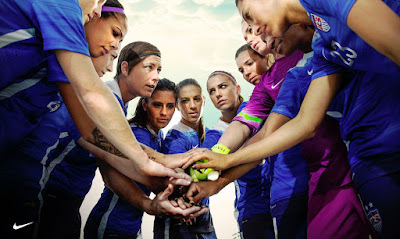 The tournament favorites include reigning champs Japan, top-ranked Germany, France, and the US. Sweden, Brazil, Canada and Norway could be dark horses. 8 nations are making their Women's World Cup Debut in this tournament: Cameroon, Costa Rica, Ivory Coast, Holland, Spain, Switzerland, and Thailand. Chris and I will be watching matches from Parlor Sports in Somerville. 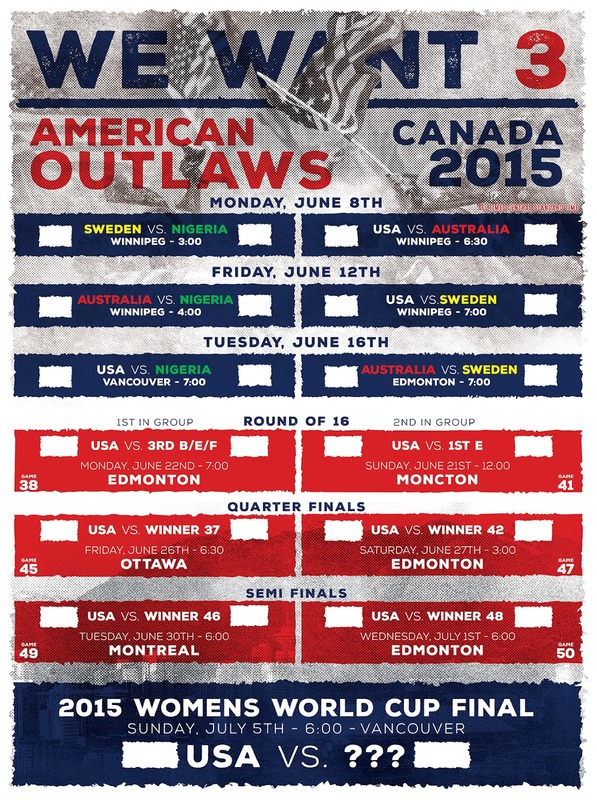 For Boston-dwelling readers, The Boston chapter of the American Outlaws will be hosting official viewing parties at The Banshee in Dorchester. Want to find a viewing party where you live? 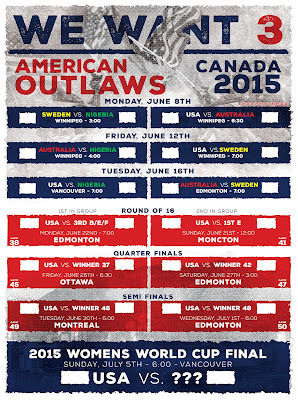 Chances are, your local American Outlaws chapter is hosting a viewing party somewhere nearby.